Gary Zelesky has had the privilege of wowing audiences around the world. Passion is center to Gary. It is in everything he does. There is no half way for this short little stick of dynamite. Gary Zelesky’s team will assist you in coordinating the details of your day. From the very beginning to the last person in the room, we are here to assist you in making this the easiest and best part of your event. Discover how knowing and embracing your passion and the passion of your team members will make your office more productive and profitable for everyone! He utilizes presentation techniques that ensure attendees will remain engaged, be educated and leave energized to become the change they seek. Your enthusiastic program offered our attendees both a professional and personal perspective on todays ever changing and demanding world. Your ablity to customize the speech to our specific goals and objectives helped to motivate our audience. Your presentation was an exciting and welcomed change to our event. I hope we have the opportunity to work together again. What an incredible presentation! The feedback I have received from the staff has been extremely positive. I know that every person that who attended the presentation walked out with the feeling that the time was well spent. My only regret is that we didn't allow for more time. However, next time, (and I do hope their is a next time), we will allow for more time. Thank you for being a vital part of the program at the AAO 107th Annual Session. We recognize that the ultimate success of a meeting is determined by the efforts of the individuals who present the program and the message they convey to the audience. In this regard, it is clear that your involvement in the program contributed greatly to success of the meeting. The 107th Annual Session was a tremendous event with almost 15,000 attending. © 2019 Gary Zelesky Now. 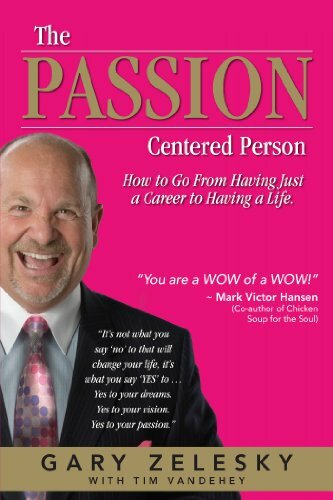 Sign up here to recieve a free chapter of Gary's book, The Passion Centered Person! This books shows you how to recognize and embrace your passion. How to plan for your passion. And how to bring your passion to life without sacrificing your current career!